Implements the 'rquery' piped Codd-style query algebra using 'data.table'. This allows for a high-speed in memory implementation of Codd-style data manipulation tools. rqdatatable is an implementation of the rquery piped Codd-style relational algebra hosted on data.table. rquery allow the expression of complex transformations as a series of relational operators and rqdatatable implements the operators using data.table. For example scoring a logistic regression model (which requires grouping, ordering, and ranking) is organized as follows. For more on this example please see "Let’s Have Some Sympathy For The Part-time R User". We can show the expanded form of query tree. And execute it using data.table. One can also apply the pipeline to new tables. Initial bench-marking of rqdatatable is very favorable (notes here). Note rqdatatable has an "immediate mode" which allows direct application of pipelines stages without pre-assembling the pipeline. "Immediate mode" is a convenience for ad-hoc analyses, and has some negative performance impact, so we encourage users to build pipelines for most work. Some notes on the issue can be found here. 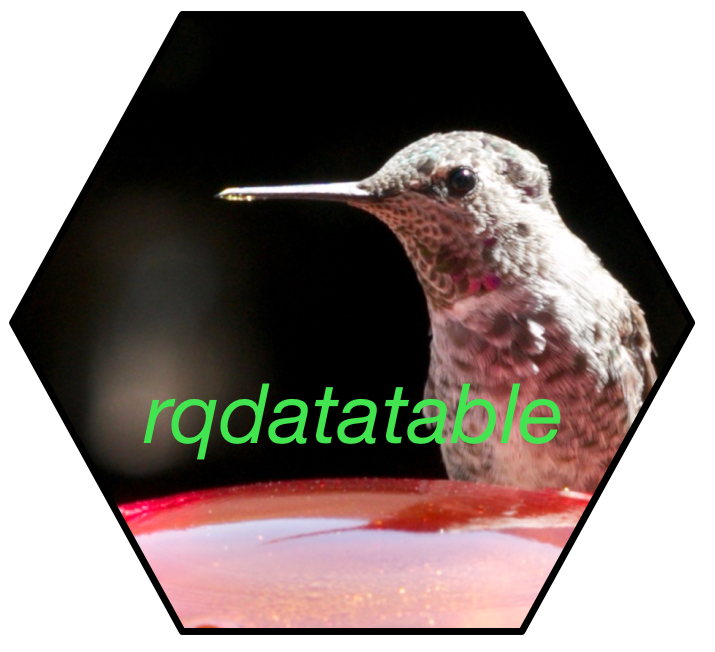 rqdatatable is a fairly complete implementation of rquery. The main differences are the rqdatatable implementations of sql_node() and theta_join() are implemented by round-tripping through a database handle specified by the rquery.rquery_db_executor option (so it is not they are not very desirable implementation). To install rqdatatable please use install.packages("rqdatatable"). extra copy in ex_data_table.relop_list() (just in case). Allow more control of ordering in extend. More of force parent.frame forcing. Add row limit to order. allow no group columns project. work on ordering in extend. Fix full join print glitch. Adapt to instant execution path. Don't use isFALSE() (new to R 3.5.0).